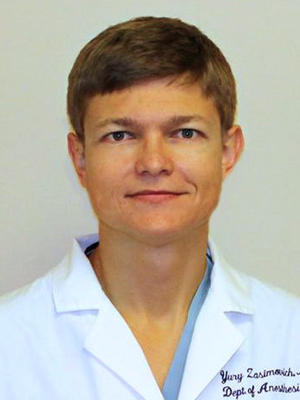 Dr. Zasimovich completed his anesthesiology residency at the University of Florida and was named chief resident in 2013, he then followed with a fellowship with our Acute Pain and Perioperative Pain Medicine Division. Some of his current research interests include: “Transferrable training in thoracic epidural and paravertebral blocks using an advanced mixed-reality simulator” and “The diagnostic validity of laser-Doppler flowmetry, transmittance tissue oximetry, and invasive pressure monitoring in chronic exertional compartment syndrome – which one wins the gold?” He is a reviewer for the Journal of Pain Medicine, has many publications and an active member in several professional societies. André P. Boezaart, MD, PhD, Yury Zasimovich, MD, Hari K. Parvataneni, MD: Editorial in Pain Medicine 2014 (in press)Long-Acting Local Anesthetic Agents and Additives: Snake oil, Voodoo or the Real Deal?